Who doesn’t love a puppy? Adorable, floppy, and downright goofy, every home cherishes these early days. But with puppyhood comes… potty training. Follow our six simple steps to build a strong potty training foundation with your pup. Crates should be big enough for your puppy to stand up, turn around, and lie down. If you get a crate for the puppy to grow into, make sure your crate comes with a wire divider. Place the wire divider in the crate to limit the amount of room he/she has. *Crate training is not a license to confine pets for half a day. For more explicit crate training instructions click here. Puppies are able to hold their bladders for as many hours as their age in months (up to 9 months). For example, a 3 month old puppy will be able to hold his/her bladder for ±3 hours. This means that you should take your puppy out of his/her crate every few hours. Potty training takes a full year to master on average. Do not feel discouraged or resentful if your potty training dog has accidents. However, frequent indoor accidents after 1 year could indicate a medical problem, and you should consult a vet. 3. Create a Feeding Schedule. A set feeding schedule is key to potty training success. It becomes hard to control your puppy’s bladder if they are eating and drinking as they please. Feed puppies under 6 months, 2-3 times daily. Make sure that you are dividing their daily intake recommendation by number of feedings to prevent overfeeding. Immediately after your puppy eats, take them potty. 3. Repetition is the Key to Mastery. 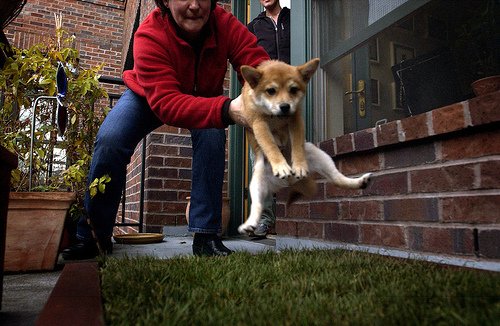 Take puppy out to the same spot every time, and give a chosen command (“go potty”). This will help your puppy understand your expectation. After several eliminations, your puppy should recognize the area’s smell and encourage him/her to go potty. 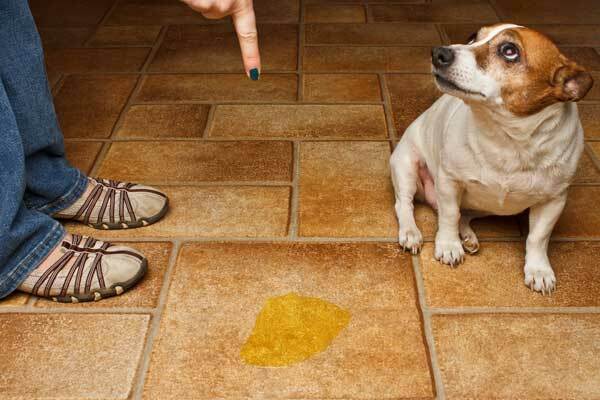 When your puppy is at their designated potty spot, keep them on leash, and allow them 10-15 minutes to sniff around. Reward puppy with a treat immediately after elimination. When you bring them back inside, allow them around 30 mins of action-packed play and running around. Excitement can also cause a puppy to go potty, so be sure to take him/her outside for a potty opportunity before crating again. If your puppy doesn’t go potty, place him/her back inside the crate. Try again in 15-30 mins. You may have to take them in and out a few times, but maintain your patience and keep encouraging your pup. Even though puppy potty training can be frustrating and long, there are common practices that hinder the potty training process. DO NOT shove your dog’s muzzle in his/her mess. Dogs do not have the intellectual capacity to connect their urine and feces. This will only teach your dog to fear you. DO NOT scold your dog or be aggressive as you’re waiting for them to go potty outside. You will create a negative association with their designated potty space. DO NOT free-feed. This will make it hard for you and your dog to control their bladder and bowels. DO NOT leave your puppy in the crate for the entirety of your work day. If you are gone for longer than they can hold their bladder, hire a dog walker.